Naomi Campbell’s high-profile court appearance just gets more and more interesting. Earlier this month, at the war crimes trial of Liberian supervillain Charles Taylor, the supermodel admitted to receiving a few “very small, dirty-looking stones” in a hotel room at night from a couple of mysterious men she didn’t know. (She presumes the stones were a gift from Taylor.) 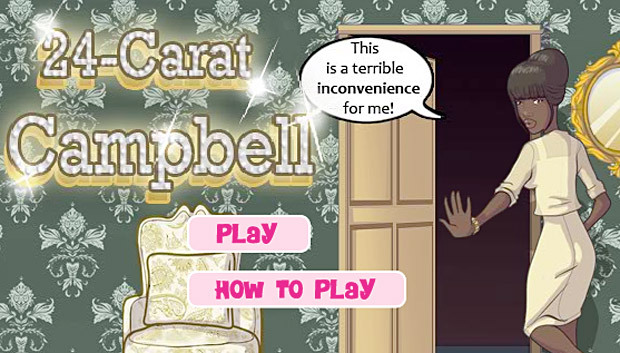 Just a few weeks later, London online game maker Blouzar — previously known for such games as “Little Hooliganz” and “Miss Bimbo”, have created a game called 24-Carat Campbell. The goal of the game is to throw blood diamonds at the supermodel’s avatar. Campbell protests her innocence in the matter and is appearing as a witness for the prosecution. Not that this matters to Blouzar: “Try and deliver diamonds to Naomi!” read the instructions. “She gets gifts all the time, even at night! Remember that she hates dirty-looking pebbles and is used to big, sparkling diamonds in a box.” No word on whether an expansion pack will feature Mia Farrow, who has also testified in the trial.